Save $25 off your first air conditioning or furnace repair service. Enter promo code HC2010 in the comment field when scheduling or present at time of service. New customers only. Receive a 15% discount for any heating or air conditioning repair. Military ID and coupon must be presented at time of repair. Did you know that DTE has a program that may qualify you to receive a FREE furnace. If you qualify for this program, beginning February 1st DTE will contribute up to $2800 towards a new furnace. Call 231-766-9133 and one of our specialists will be more than happy help you! 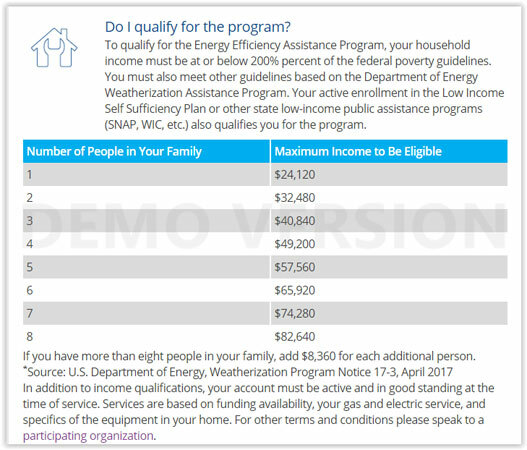 Below are some of the income qualifications for your reference.